1.In a large pot cook spaghetti and sundried tomatoes in boiling salted water until al dente. Drain well. 2. Meanwhile, in a large skillet brown cubed chicken. 3. Pour saucepan over cooked chicken and simmer over medium-low heat. Add salt, pepper and Cook until heated through. 4. Combine cooked spaghetti with sauce in the large skillet. 5. Plate the warm spaghetti and garnish with parsley. I love this recipe because it was quick and easy. The kids like it and clean up is also easy. 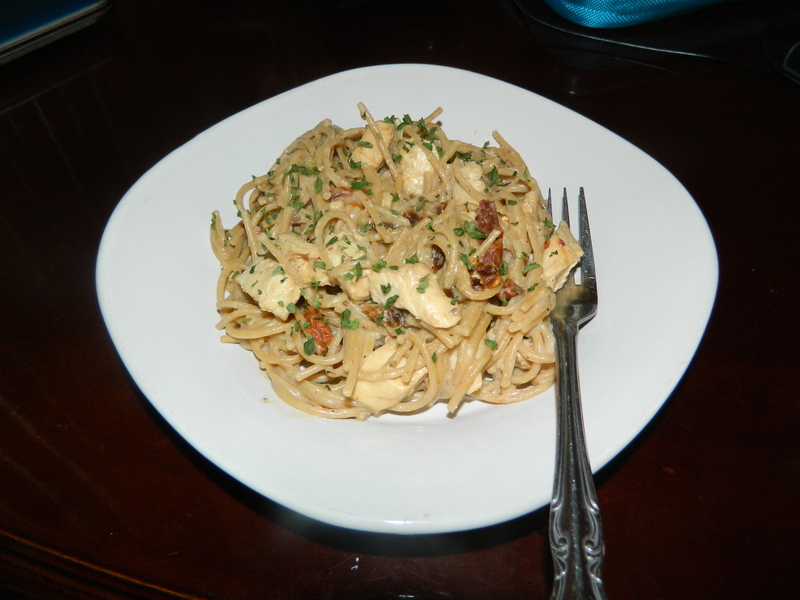 Posted in Parenting, Recipes and tagged chicken alfredo, easy dinner ideas, sundried tomatoes, whole wheat spaghetti. Bookmark the permalink. Posted in Uncategorized and tagged Alexander Wang, CARAT*, Carvela, Doublju, fashion, ONLY, polyvore, Softech, style. Bookmark the permalink.